also known as Visitor Guides, Gallery Guides, Gallery Maps, and Floor Plans. Since its opening the Cleveland Museum of Art expanded its gallery and public space in four major additions and renovations. Each Expansion allowed the reorganization and reimagining of the museum’s collections. For general museum maps by era, use the quicklinks in the first section. For maps at more specific moments in the museum's history use the second section. Please use Gallery Maps and Numbering History, 1916-2009 for historic collections' location by gallery. Specific maps by museum milestone, arranged chronologically. 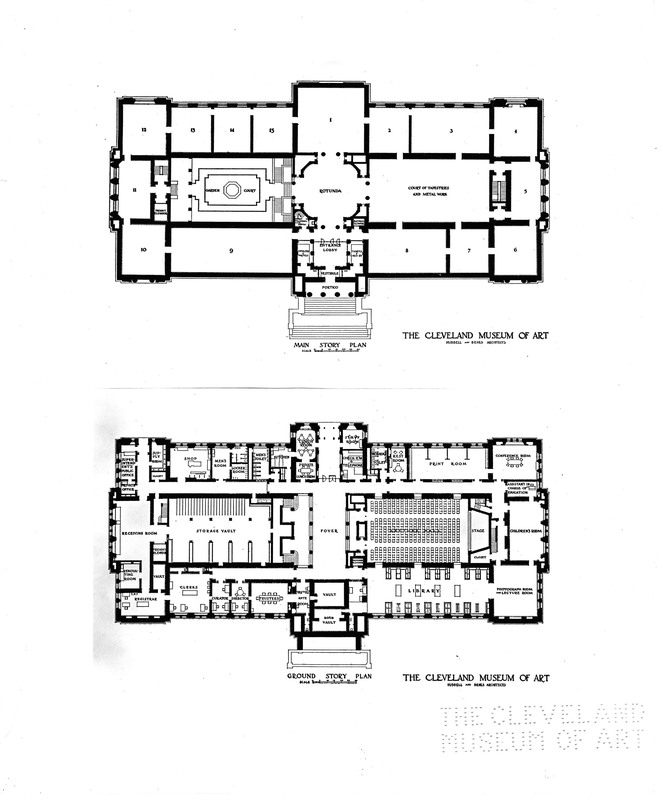 Cleveland architects Benjamin Hubbell and W. Dominick Benes were engaged to design and construct the new museum. After a study of museum buildings nationally and worldwide, Hubbell and Benes designed a Beaux Arts style building with two wings flanking a central rotunda. Construction began in 1913 and was completed for the June 1916 opening. The gallery level housed the main entrance on the south side of the building facing Wade Park. Fifteen galleries plus the Armor Court and Interior Garden Court surrounded the Rotunda. Over 50 years after opening, the museum expanded to provide long demanded space for its growing collections and educational activities. The museum's second expansion symbolized the increasing concern of the museum with its interpretive and public service functions. The new wing housed all the external services of the museum, most notably its education offices, lecture halls, special exhibitions space, and the new Gartner Auditorium. Following the completion of building, most of the galleries were closed and reinstalled in five phases. The Asian Galleries were relocated to the 1916 Building's first floor and sublevels during the Breuer Renovation and Expansion Project. Please note level 3 is the lowest level. The museum added a new wing for additional gallery space and to house the growing library. Between 1991 and 1993 all galleries were renumbered. Galleries on the ground floor had one hundred added to the number (ex. gallery 10 became gallery 110). Galleries on the second floor had two hundred added to the number (ex. Gallery 29 became gallery 229). In March 2003 the museum started Project 244, a new gallery dedicated exclusively to changing exhibitions of contemporary art. Many maps combined into one document detailing the progression of gallery closures during the early stages of the Viñoly Renovation and Expansion Project. Many maps combined into one document detailing the progression of gallery openings during the later stages of the Viñoly Renovation and Expansion Project. The museum returned more than 900 works of art to 19 spectacularly renovated galleries on the second floor of its historic 1916 Building. The 139,200-square-foot East Wing connects the 1916 Building, designed by Hubbell and Benes, and the 1971 addition by Marcel Breuer. Viñoly’s design for the addition unites two historically significant buildings with a third, new structure that contributes to the greater architectural whole of the museum. Gartner Auditorium was the centerpiece of the Marcel Breuer addition to the museum in 1970. The museum closed the auditorium to improve its acoustic performance and for refurbishment. Collections from the ancient Near East, Greece, Rome, and Egypt, as well as works from late antiquity, the Byzantine Empire, the European Middle Ages, and Africa, returned to public view on June 26. The modern and contemporary galleries closed to fix a condensation problem in the East Wing. Shortly after their reopening, the museum partially opened the atrium, ending the art detour through the basement. The atrium was later renamed the Ames Family Atrium and officially opened completely on 28 October 2012 which coincided with the opening of the new store and dining services. One visitor guide outlines the the final stages of the Renovation and Expansion Project for the Viñoly 2011 Building. It spans the dates of the following milestones. 10 galleries opened featuring the artwork of late medieval, Renaissance, and Islamic Collections. Pre-Columbian, Native North American, Japanese, Korean and textile collections returned to public view. The final milestone of the Renovation and Expansion Project, the museum opened the new West Wing featuring the Chinese and Southeast Asian art collections.